Morocco is a fantastic family destination as it offers mountains, trekking, wild coast, surfing, desert and an immensely different culture, yet it is only 3 1/2 hours flight from the UK and in the same time zone. Added to that, several of the airports are serviced by cheap flight providers from the UK and you have a reasonably priced adventure in your midst. Our Morocco family holidays provide a blend of adventure and culture and have been designed for families who want a unique holiday. 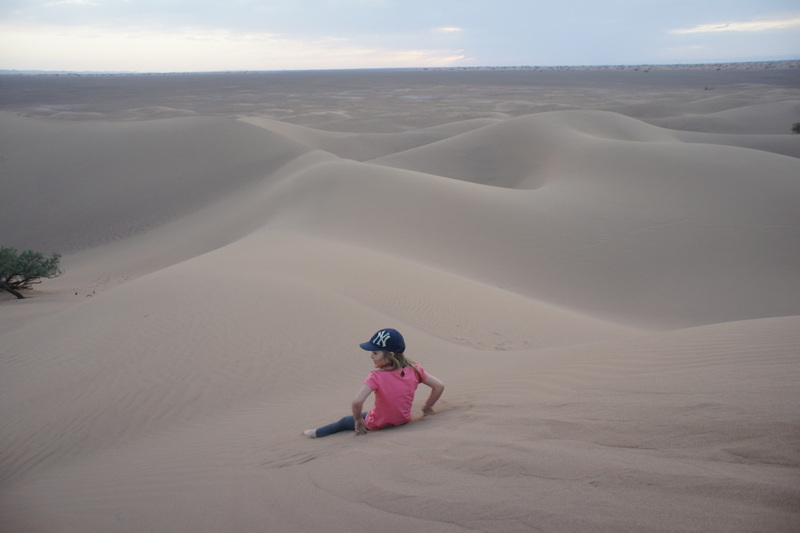 Many of our trips involve activities such as trekking, desert camping or surfing and accommodation is always in hand-picked riads and guest houses. First time visitors to Morocco will almost certainly want to visit Marrakech, a lively and exciting city with a real buzz. 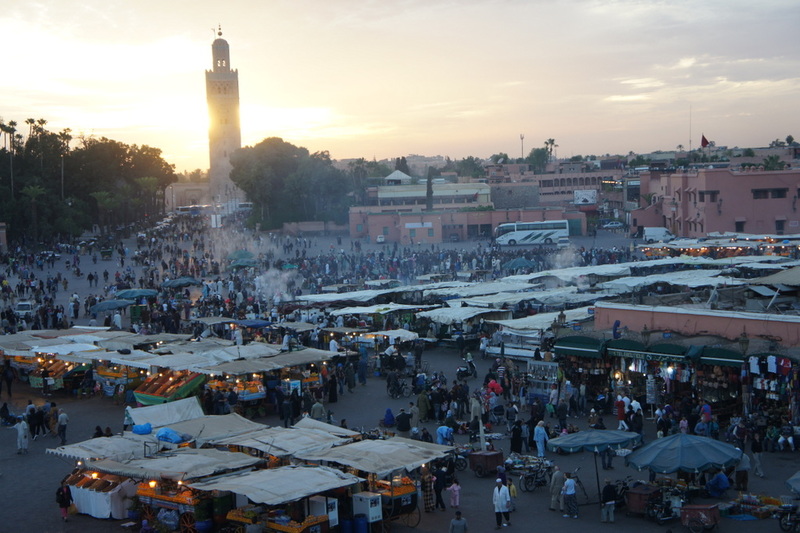 The focal point of the old town is the main square, the Djemma el Fna. In the evenings, snake charmers, drummers, acrobats, story tellers and food sellers congregate, creating an electric atmosphere. It can be quite a culture shock for first time visitors, but get stuck in and it will be an experience to remember forever. 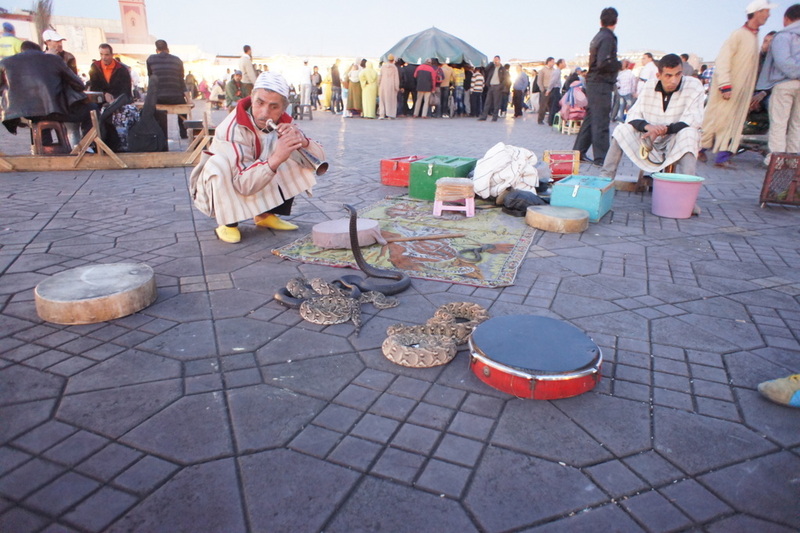 There are several sites to see in Marrakech, but the key is not to overload on them. 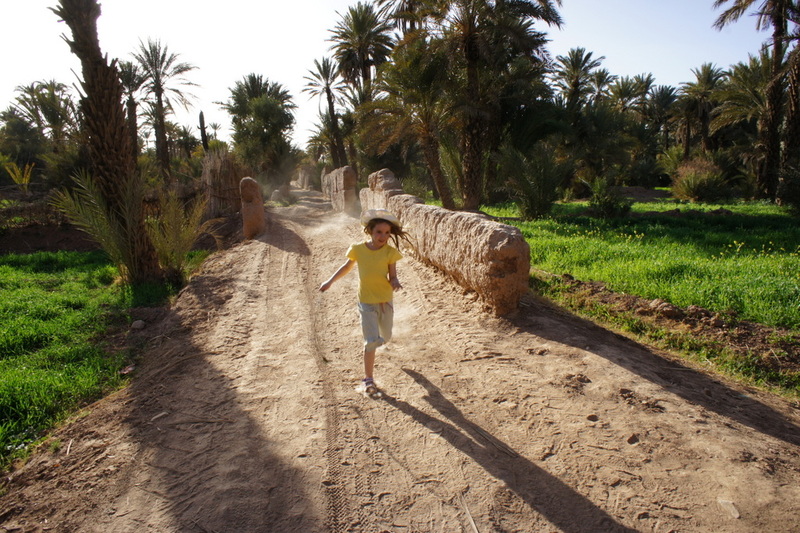 The Bahia and el Badi palaces are well worth a visit, as they offer a chance for the children to run off a bit of steam, as do the Majorelle Gardens. 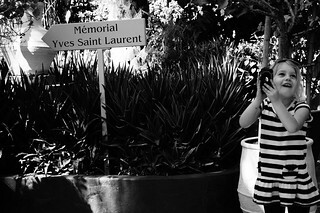 Designed by the late Yves Saint Laurent, the vibrant colours and cacti are a great contrast to the dusty city (and there is a nice cafe there). Back in the medina, most visitors will spend at least half of their time exploring the souks (markets) with stall holders selling everything from lamps to tea pots to rugs. With motorbikes, cyclists and donkeys jostling to get past, the souks can be chaotic to say the least, but children will be intrigued by all of the stalls. A visit to the spice market is highly recommended for the interest factor )and there is a nice cafe there.) In Marrakech, we have hand-picked some child friendly accommodation where children are welcome, but not at the expense of the atmosphere. 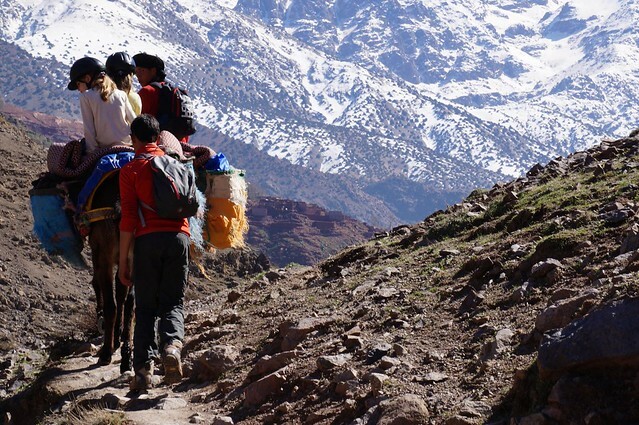 For those with a love of the outdoors, a trek in the Atlas Mountains is not to be missed. You can choose from 2 - 6 day treks depending on the fitness and ages of the children, but most families opt for 2 or 3 days. Accommodation out on the treks is very basic, you will all stay in one room together and there are shared (and very basic) facilities. The walking itself is stunning, with deep, lush valleys and proper peaks. All of our treks are supported with mules to carry your bags and when families trek ,we provide an extra mule for when children need to rest their weary legs. After a couple of days in the mountains, many people choose to stay in a guest house with a pool afterwards. 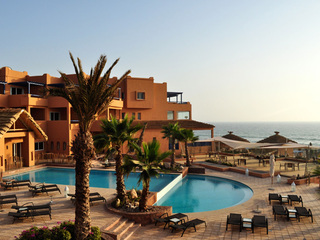 Morocco enjoys a stunning coastline to the West, with large Atlantic rollers and vast sandy beaches. There are several fantastic hotels and villas if you just want to relax around the pool and on the beach. The surf can be rough for young children, so it is worthwhile making sure you are staying somewhere with a pool. 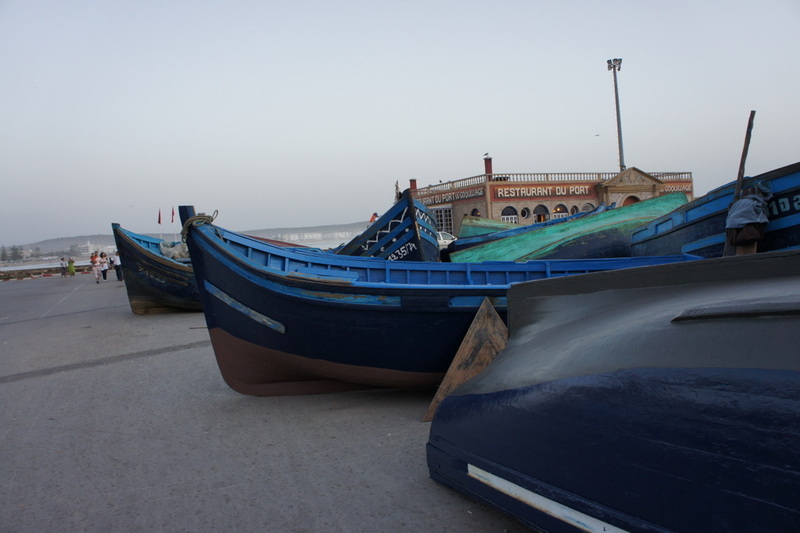 The area around Essaouira is highly recommended for families. This laid-back coastal town offers a relaxed medina, gorgeous beach and the closest thing to cafe culture that you get in Morocco. Children wll love playing games on the huge beach and climbing on the ramparts. Parents will love the bohemian feel and fresh fish on offer at every corner. 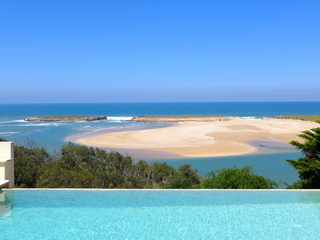 Oualidia is also an excellent option, especially for those with young children as it has sheltered lagoon beaches. 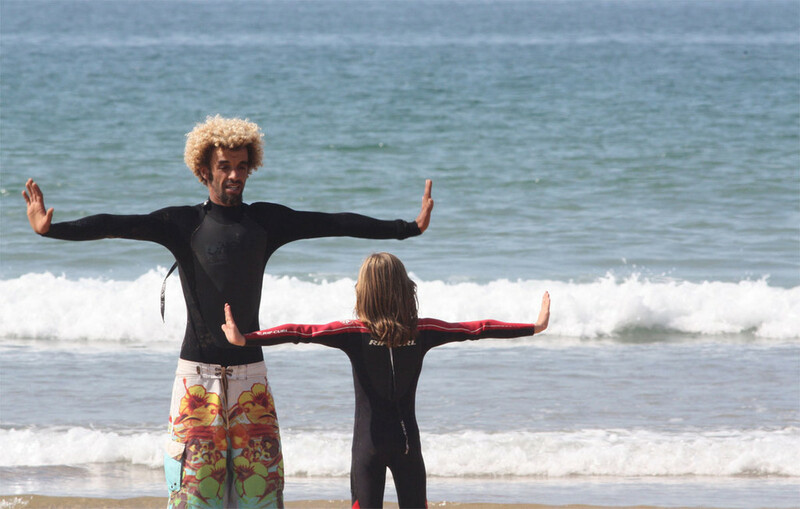 For the more active, the summer months offer perfect conditions for younger surfers and you may enjoy staying at a surf camp with daily lessons for the whole family. Camels, kasbahs, enormous palm trees and vast sand dunes, the Moroccan desert is a geography lesson that your children will never forget. You can almost trip over Unesco World Heritage sites, with Ait Ben Haddou, a crumbling citadel, one of the most popular. Made famous from films such as Gladiator, it is accessed by stepping stones over a River and you are then free to explore at your leisure. Children will love climbing to the top and exploring the dilapidated buildings. (There is absolutely no pretence of health & safety here) This part of the desert is predominantly rocky, but if you don't mind long car journeys, you can head out to the Sahara to see vast sand dunes up close. 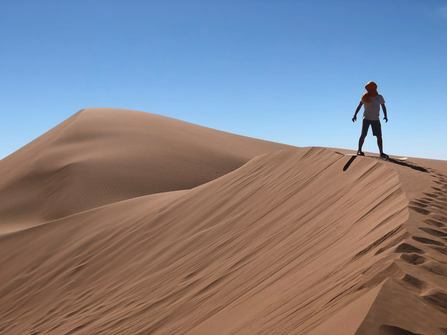 Once in the desert, you can travel out to a traditional Berber camp, where you will sleep under the amazing Saharan sky and climb up and roll down sand dunes to your heart's content. Camps vary from basic wild camping with no facilities to luxury camps with proper beds. No trip to the desert is complete without a camel trek, which children of all ages will love. On the way back from the desert, don't miss the chance to stay in one of the many palmeries you will see along the way. These vast oases offer fertile land awash with date palms, cacti and farmlands. A wander through a palm grove is the perfect way to round off a trip to the desert. Summer Holidays: In July and August, the Coast and Mountains are lovely temperatures with the hot weather tempered by the Atlantic and altitude respectively. The Desert is really very hot during this period and best avoided unless you are very determined to get out there and don't mind the heat. Marrakech itself can get very hot, it is a dry heat and quite manageable if you manage your days sensibly and avoid being in the sun in the middle of the day. October Half Term: This is a great time to head out to the Sahara, trek in the Mountains, visit Marrakech or even head to the Coast. Book flights early to avoid the high flight costs that are typically prevalent for October half term. 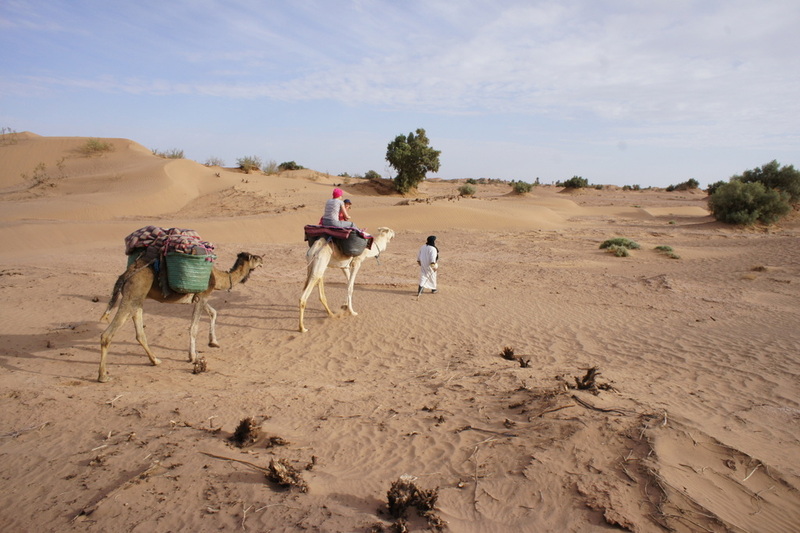 Christmas Holidays in Morocco: Morocco is an excellent option for the Christmas holidays. With a climate similar to the Canary Islands, you can expect warm sunny weather and cooler evenings, a lovely contrast to back home. Marrakech can get busy with people heading here for short breaks over New Year's Eve, otherwise, the Mountains, Desert and Coast are mercifully free of the usual peak pricing that applies to heading on holiday over the Christmas holidays, the flights are also usually very reasonable. Although you can expect some good sunny weather, it is not usually warm enough for outdoor swimming pools / sun bathing on the beach. The Sahara Desert is lovely at this time of year. 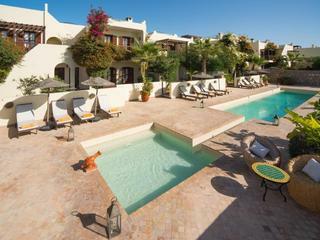 February Half Term in Morocco: It is a similar story for Fab half term as the Christmas holidays, if you book early you can get some excellent flight prices and the weather can be lovely around 15 - low 20s Celsius. Easter Holidays in Morocco: This is peak season in Morocco and one of the most beautiful times to be here. The weather is lovely and the mountains are verdant, with rushing streams full of meltwater from the high peaks. Again, it pays to book early to get the best flight prices, but we can usually still help at the last minute particularly if you are want to get away in the second week of Easter holidays. Marrakech gets very hot in the summer months - children will probably only be able to tolerate the intense heat for a day or two. The coast and mountains both provide the perfect antidote to the heat of the summer. You can get out to Ait Ben Haddou in the summer months, but a trip out to the dunes is only possible from September - May due to the heat. 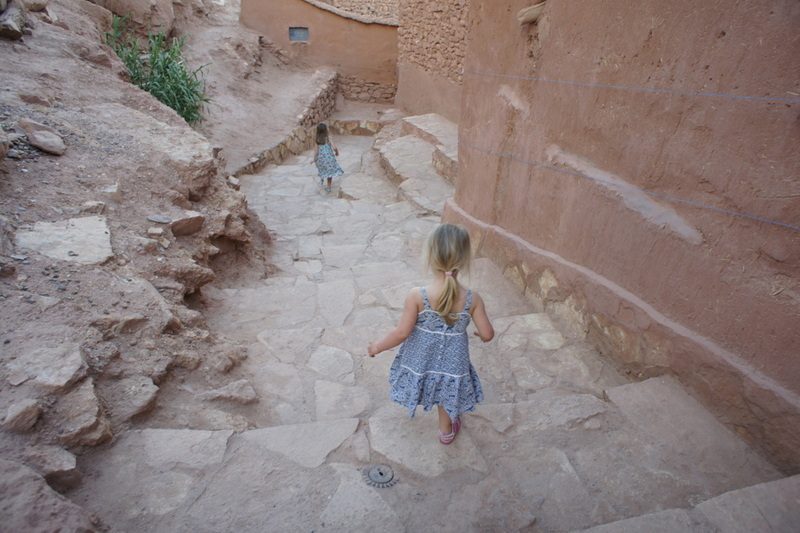 The best part about travelling in Morocco with children is that you don't have to sacrifice your travelling spirit for the sake of your brood. It is perfectly possible to stay in characterful accommodation with an individual style. 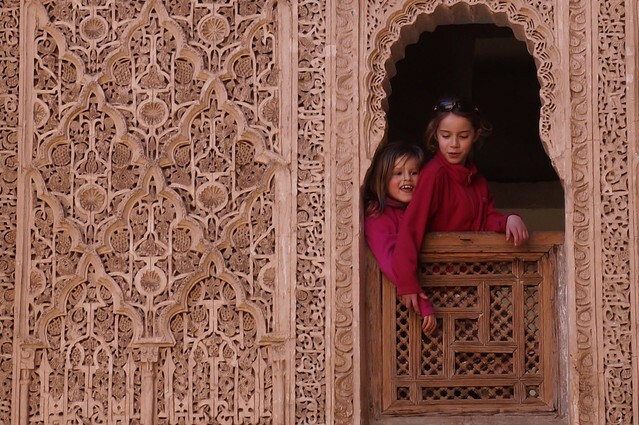 Many of the traditional riads have family rooms or suites and roof terraces make terrific places to play hide and seek for younger children and to lie back on a sun lounger and listen to an i-pod, for older children. The only pitfall of staying in these types of places is that they haven't been rigorously tested for health and safety and will almost certainly have balconies and steep stairs - parents need to keep a watchful eye. We have hand-picked some of the best family friendly accommodation to be found and road tested it with young children ourselves, so please don't hesitate to get in touch for help in planning your family holiday. We include private transfers witha lovely team of local drivers and safe, modern vehicles. Car seats are not particularly common and if you have a small child, please bring your car seat with you. (BA & BMI will allow you to bring a car seat in the hold free of charge). It is also possible to hire cars, and this can work for more adventurous families heading out to the Desert or the Coast. Depending on your child, the prospect of trying lots of new foods can either be very exciting or incredibly daunting. Breakfasts in riads and hotels are breads, jams and pastries and children will almost certainly be offered hot or cold chocolate as an accompaniment. Many places will serve pasta and pizza as well as local food, but if you want to only eat local, there are tagines, cous cous and kebabs which are fairly accessible to children.